After almost two years of Sheen's cause being at a complete standstill they are finally able to take a step towards re-opening the cause! Reading the press release from the Diocese of Peoria, it seems that Venerable Sheen's family became tired of waiting for New York and decided to take matters into their own hands - by petitioning the state's courts for access to their uncle's remains! 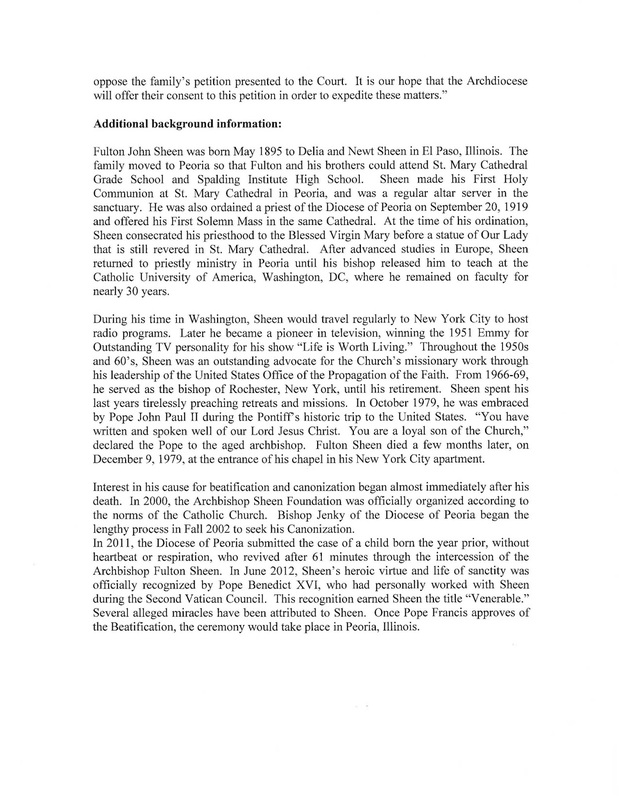 Since Joan Sheen Cunningham is Venerable Sheen's oldest living relative and she and her siblings were very close to their uncle it seems very likely that the New York courts will see her as obvious next-of-kin and will grant this request. As a refresher, the cause was closed when Cardinal Dolan refused to allow the Sheen Foundation access to Fulton Sheen's body. The Sheen Foundation had reached the point in the canonization process where examining the remains and respectfully gathering relics was appropriate and the canonical norm. 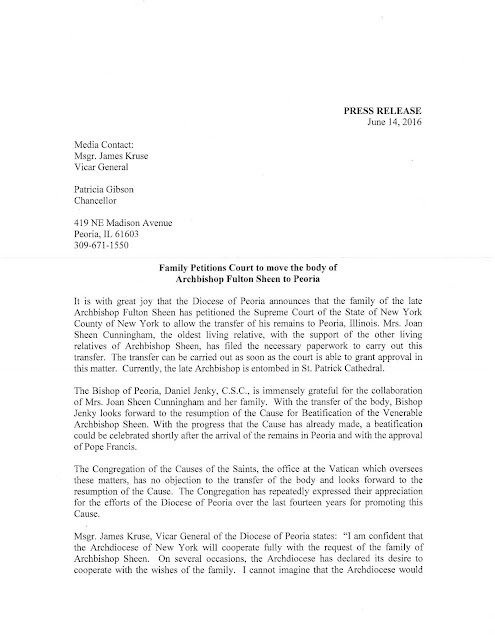 Without cooperation from the Archdiocese of New York and without special permission from the Vatican to bypass the canonical norms the cause could go no further. 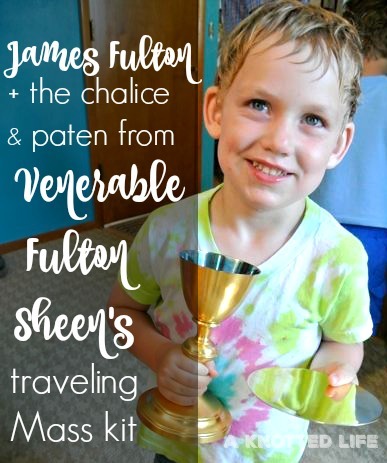 Further, before the "Pause in the Cause" we were half way through the four-step process of having the alleged miraculous healing of my son, JF, through the intercession of Venerable Sheen declared an official miracle. Here's a little about the advising medical experts and advising theologians unanimously approving the alleged miracle. The next steps would be - God willing! - for the Congregation for the Causes of Saints and then Pope Francis to approve it. If and when that happens Fulton Sheen will be beatified for the greater glory of God and the good of the Church. For more about our family's connection with Fulton Sheen and his cause for canonization go here. To see the news from the Sheen Foundation go here. To read about it from the National Catholic Register go here. Bonnie! This is such wonderful news. My husband and I named our third sin Fulton (Ryan grew up in the diocese of Joliet, but near the university Sheen attended) just two days before the cause was paused. Ryan was so disappointed. I immediately sent him your blog so that he could rejoice. We will continue to pray that the path to sainthood continue, for the greater glory of God. Thanks for the update. So...I didn't really mean to call my son a sin....he wasn't, and the others aren't either. Big time OOPS! So exciting!!! Thank you for keeping us updated - continued prayers! This is incredibly wonderful news! Praying that the NY court moves on this quickly! Oh Bonnie! I'm sitting here at swim lessons trying not to cry with joy. That's amazing news!!!!! Tears of joy are flowing from this excellent news! What reason does Cardinal Dolan give for not allowing the cause to go further? Yay! This is wonderful news, thanks for sharing and updating us. Praying it continues to move forward.